Tobacco use is the leading single preventable cause of death worldwide, killing over 7 million people each year. Cigarettes are addictive by design, and smoking cigarettes can damage every part of the body, causing different cancers from the head or neck to the lungs and cervix and other chronic conditions such as stroke and heart disease, which lead to early death. The direct and indirect economic costs are also enormous, totaling more than US$1.4 trillion. Controlling tobacco use is critical for the achievement of the health and social and economic targets in the 2030 Agenda for Sustainable Development. The WHO report indicates that 43% of the world’s population (3.2 billion people) are now covered by two or more MPOWER measures at the highest level, nearly seven times the number covered in 2007. Eight countries, including five low- and middle-income ones, have implemented four or more MPOWER measures at the highest level: Brazil, Islamic Republic of Iran, Ireland, Madagascar, Malta, Panama, Turkey, and the United Kingdom of Great Britain and Northern Ireland. Monitoring: Several countries, such as Nepal, India, and the Philippines, that conducted WHO-backed initiatives to monitor tobacco use have used the information to adopt measures to protect people from tobacco use. For example, Philippines’ landmark Sin Tax Reform Law was passed in 2012 after its 2009 global adult tobacco survey showed high smoking rates among men (47.4%) and boys (12.9%). The implementation of this policy measure has contributed to declining tobacco use as evidenced by the country’s 2015 adult tobacco survey results. Protect: Comprehensive smoke-free legislation is currently in place for almost 1.5 billion people in 55 countries. Dramatic progress has been witnessed in low- and middle-income countries, 35 of which have adopted these laws since 2007. Offer: Appropriate cessation treatment is in place for 2.4 billion people in 26 countries. Warn: More people are protected by strong graphic pack warnings than by any other MPOWER measure, covering almost 3.5 billion people in 78 countries – almost half (47%) the global population. And, 3.2 billion people live in a country that aired at least one comprehensive national anti-tobacco mass media campaign in the last two years. Enforce: Bans on tobacco advertising, promotion, and sponsorship interfere with the tobacco industry’s ability to promote and sell its deadly products and reduce tobacco use. But only 15% of the world’s population is currently covered by a comprehensive ban. Raise: Raising taxes to increase tobacco product prices is the most cost-effective measure to reduce tobacco use and encourage users to quit, but it is one of the least used tobacco control measures globally. As an institution, the Bank has long been committed to tobacco control as reflected in its unambiguous Operational Directive 4.76 of 1999 that mandates that the World Bank Group does not lend directly or provide credits, grants, or guarantees for tobacco production, processing, or marketing. 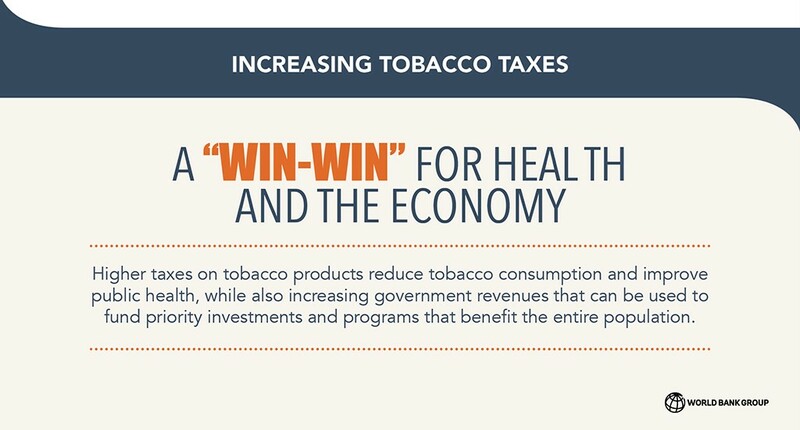 The Bank’s policy advice and technical assistance support tobacco tax increases to protect the population from health risks and to mobilize additional domestic resources. Over the past two decades, Bank teams have carried out substantial analytical work to build the global knowledge base on issues related to tobacco control. In recent years, the Bank, in partnership with the Gates and Bloomberg Foundations, and in coordination with WHO, has supported countries in the design of tobacco tax policy reforms to raise prices, reduce consumption, and mobilize domestic resources in accordance with the 2015 Financing for Development Addis Ababa Action Agenda. In addition to support provided to the reforms in Philippines in 2012, in Botswana in 2013, in Ghana in 2014, and in Peru in 2015, the Bank’s assistance to Armenia, Colombia, Moldova, and Ukraine contributed to the adoption of significant tobacco tax increases in 2016. The total population covered by these policy actions is about 250 million people. Ongoing support is being provided in 2017 to an additional set of countries across regions, including Montenegro, where the government recently announced that tobacco taxes will be increased over the next 3 years in line with the European Union Tobacco Tax Directive’s target rates, and in Lesotho, as part of the 2017 budget presented by the new government to Parliament. In moving the global tobacco control agenda forward, as the findings of the 2017 WHO report suggest, a dedicated focus by governments with support of the international community is required to raise tobacco taxes since it continues to be the least used tobacco control measure. This is of critical importance to make these deadly products unaffordable, reduce consumption among current smokers, and prevent smoking initiation among children and youth. While health is the main objective, we also need to argue, on the basis of country evidence from across the world, that raising tobacco taxes can generate a significant fiscal benefit by helping to expand a country’s tax base and increase the budgetary capacity of governments to fund priority investments and programs that benefit the entire population. Posted in: Report, Tobacco Control, Tobacco Tax, WHO.